The early Greek concept of form precedes attested philosophical usage and is represented by a number of words mainly having to do with vision, sight, and appearance. The words, εἶδος (eidos) and ἰδέα (idea) come from the Indo-European root *weid-, "see". Eidos (though not idea) is already attested in texts of the Homeric era, the earliest Greek literature. This transliteration and the translation tradition of German and Latin lead to the expression "theory of Ideas." The word is however not the English "idea," which is a mental concept only. The meaning of the term εἶδος (eidos), "visible form", and related terms μορφή (morphē), "shape", and φαινόμενα (phainomena), "appearances", from φαίνω (phainō), "shine", Indo-European *bhā-, remained stable over the centuries until the beginning of philosophy, when they became equivocal, acquiring additional specialized philosophic meanings. The pre-Socratic philosophers, starting with Thales, noted that appearances change, and began to ask what the thing that changes "really" is. The answer was substance, which stands under the changes and is the actually existing thing being seen. The status of appearances now came into question. What is the form really and how is that related to substance? Thus, the theory of matter and form (today's hylomorphism) was born. Starting with at least Plato and possibly germinal in some of the presocratics the forms were considered as being "in" something else, which Plato called nature (physis). The latter seemed as carved "wood", ὕλη (hyle) in Greek, corresponding to materia in Latin, from which the English word "matter" is derived, shaped by receiving (or exchanging) forms. The Forms are expounded upon in Plato's dialogues and general speech, in that every object or quality in reality has a form: dogs, human beings, mountains, colors, courage, love, and goodness. Form answers the question, "What is that?" Plato was going a step further and asking what Form itself is. He supposed that the object was essentially or "really" the Form and that the phenomena were mere shadows mimicking the Form; that is, momentary portrayals of the Form under different circumstances. The problem of universals – how can one thing in general be many things in particular – was solved by presuming that Form was a distinct singular thing but caused plural representations of itself in particular objects. For example, Parmenides states, "Nor, again, if a person were to show that all is one by partaking of one, and at the same time many by partaking of many, would that be very astonishing. But if he were to show me that the absolute one was many, or the absolute many one, I should be truly amazed. ":p129 Matter is considered particular in itself. For Plato, forms, such as beauty, are more real than any object that imitate them. Though the forms are timeless and unchanging, physical things are in a constant change of existence. Where forms are unqualified perfection, physical things are qualified and conditioned. Plato often invokes, particularly in his dialogue Phaedo, where he first presented his theory of forms, Republic and Phaedrus, poetic language to illustrate the mode in which the Forms are said to exist. Near the end of the Phaedo, for example, Plato describes the world of Forms as a pristine region of the physical universe located above the surface of the Earth (Phd. 109a-111c). In the Phaedrus the Forms are in a "place beyond heaven" (huperouranios topos) (Phdr. 247c ff); and in the Republic the sensible world is contrasted with the intelligible realm (noēton topon) in the famous Allegory of the Cave. According to Plato, Socrates postulated a world of ideal Forms, which he admitted were impossible to know. Nevertheless, he formulated a very specific description of that world, which did not match his metaphysical principles. Corresponding to the world of Forms is our world, that of the shadows, an imitation of the real one  Just as shadows exist only because of the light of a fire, our world exists as, "the offspring of the good". Our world is modeled after the patterns of the Forms. The function of humans in our world is therefore to imitate the ideal world as much as possible which, importantly, includes imitating the good, i.e. acting morally. ↑ Modern English textbooks and translations prefer "theory of Form" to "theory of Ideas", but the latter has a long and respected tradition starting with Cicero and continuing in German philosophy until present, and some English philosophers prefer this in English too. See W. D. Ross, Plato's Theory of Ideas (1951). ↑ The name of this aspect of Plato's thought is not modern and has not been extracted from certain dialogues by modern scholars. The term was used at least as early as Diogenes Laertius, who called it (Plato's) "Theory of Ideas:" Πλάτων ἐν τῇ περὶ τῶν ἰδεῶν ὑπολήψει...., "Plato". Lives of Eminent Philosophers. Book III. p. Paragraph 15. ↑ Plato uses many different words for what is traditionally called form in English translations and idea in German and Latin translations (Cicero). These include idéa, morphē, eîdos, and parádeigma, but also génos, phýsis, and ousía. He also uses expressions such as to x auto, "the x itself" or kath' auto "in itself". See Christian Schäfer: Idee/Form/Gestalt/Wesen, in Platon-Lexikon, Darmstadt 2007, p. 157. ↑ "Chapter 28: Form" of The Great Ideas: A Synopticon of Great Books of the Western World (Vol. II). Encyclopaedia Britannica (1952), p. 526–542. This source states that Form or Idea get capitalized according to this convention when they refer "to that which is separate from the characteristics of material things and from the ideas in our mind." ↑ "*weid-". American Heritage Dictionary: Fourth Edition: Appendix I. 2000. ↑ Possibly cognate with Sanskrit bráhman. See Thieme (1952): Bráhman, ZDMG, vol. 102, p. 128. "ZDMG online". .
↑ "*bhā-". American Heritage Dictionary: Fourth Edition: Appendix I. 2000. ↑ Liddell, H.G. ; Scott, R.; Whiton, J.M. (1891). A Lexicon Abridged From Liddell & Scott's Greek-English Lexicon. Harper. p. 725. ↑ "matter". American Heritage Dictionary: Fourth Edition. 2000. ↑ Kidder, D. S. and Oppenheim, N. D. (2006), The Intellectual Devotional, p27, Borders Group, Inc, Ann Arbor, ISBN 978-1-60961-205-4. ↑ Cratylus 389: "For neither does every smith, although he may be making the same instrument for the same purpose, make them all of the same iron. The form must be the same, but the material may vary ...."
↑ For example, Theaetetus 185d–e: "...the mind in itself is its own instrument for contemplating the common terms that apply to everything." "Common terms" here refers to existence, non-existence, likeness, unlikeness, sameness, difference, unity and number. ↑ The creation of the universe is the creation of time: "For there were no days and nights and months and years ... but when he (God) constructed the heaven he created them also." — Timaeus, paragraph 37. For the creation God used "the pattern of the unchangeable," which is "that which is eternal." — paragraph 29. Therefore "eternal" – to aïdion, "the everlasting" – as applied to Form means atemporal. ↑ Space answers to matter, the place-holder of form: "... and there is a third nature (besides Form and form), which is space (chōros), and is eternal (aei "always", certainly not atemporal), and admits not of destruction and provides a home for all created things ... we say of all existence that it must of necessity be in some place and occupy space ...." — Timaeus, paragraph 52. Some readers will have long since remembered that in Aristotle time and space are accidental forms. Plato does not make this distinction and concerns himself mainly with essential form. In Plato, if time and space were admitted to be form, time would be atemporal and space aspatial. ↑ These terms produced with the English prefix a- are not ancient. For the usage refer to "a- (2)". Online Etymology Dictionary. They are however customary terms of modern metaphysics; for example, see Beck, Martha C. (1999). Plato's Self-Corrective Development of the Concepts of Soul, Form and Immortality in Three Arguments of the Phaedo. Edwin Mellon Press. p. 148. ISBN 0-7734-7950-3. and see Hawley, Dr. Katherine (2001). How Things Persist. Oxford: Clarendon Press. Chapter 1. ISBN 0-19-924913-X. ↑ For example, Timaeus 28: "The work of the creator, whenever he looks to the unchangeable and fashions the form and nature of his work after an unchangeable pattern, must necessarily be made fair and perfect ...."
↑ "No sensible man would insist that these things are as I have described them..." (Phd. 114d). ↑ "there is no Platonic 'elsewhere', similar to the Christian 'elsewhere'." (Iris Murdoch, "Metaphysics as a Guide to Morals" (London, Chatto & Windus 1992) 399). ↑ Cf. 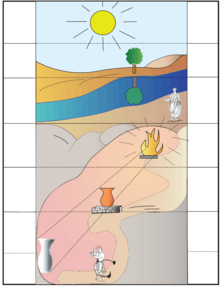 the Analogy of the Cave, Rep. 514a–520a. ↑ The word is ethnos, "people". For the full range of meanings consult the American Heritage Dictionary online under ethnic. ↑ Paragraph 399e line 5. ↑ "Types" (genē) rather than the English economic classes or the favored populations of the real Greek cities. ↑ Aristotle in Metaphysics Α987a.29–b.14 and Μ1078b9–32 says that Plato devised the Forms to answer a weakness in the doctrine of Heraclitus, who held that nothing exists, but everything is in a state of flow. If nothing exists then nothing can be known. It is possible that Plato took the Socratic search for definitions and extrapolated it into a distinct metaphysical theory. Little is known of the historical Socrates' own views, but the theory of Forms is likely a Platonic innovation. ↑ The name is from Aristotle, who says in Metaphysics A.IX.990b.15: "(The argument) they call the third man." A summary of the argument and the quote from Aristotle can be found in the venerable Grote, George (1880). "Aristotle: Second Edition with Additions". London: John Murray: 559–60 note b. |contribution= ignored (help) (downloadable Google Books). Grote points out that Aristotle lifted this argument from the Parmenides of Plato; certainly, his words indicate the argument was already well-known under that name. ↑ Analysis of the argument has been going on for quite a number of centuries now and some analyses are complex, technical and perhaps tedious for the general reader. Those who are interested in the more technical analyses can find more of a presentation in Hales, Steven D. (1991). "The Recurring Problem of the Third Man" (PDF). Auslegung. 17 (1): 67–80. and Durham, Michael (1997). "Two Men and the Third Man" (PDF). The Dualist: Undergraduate Journal of Philosophy (Stanford University). 4. ↑ Plato to a large extent identifies what today is called insight with recollection: "whenever on seeing one thing you conceived another whether like or unlike, there must surely have been an act of recollection?" — Phaedo, paragraph 229. Thus geometric reasoning on the part of persons who know no geometry is not insight but is recollection. He does recognize insight: "... with a sudden flash there shines forth understanding about every problem ..." (with regard to "the course of scrutiny") — The Seventh Letter 344b. Unfortunately the hidden world can in no way be verified in this world and its otherworldness can only be a matter of speculation. Plato was aware of the problem: "How real existence is to be studied or discovered is, I suspect, beyond you and me." — Cratylus, paragraph 439. ↑ Paragraph 50 a–c, Jowett translation. 1 2 Ross, Chapter XI, initial. ↑ Book III Chapters 3–4, paragraphs 999a ff. ↑ See "Chapter 28: Form" of The Great Ideas: A Synopticon of Great Books of the Western World (Vol. II). Encyclopaedia Britannica (1952), pp. 536–541. Welton, William A., editor (2002). Plato's Forms: Varieties of Interpretation. Lanham: Rowman & Littlefield. ISBN 978-0-7391-0514-6. "Form". Encyclopædia Britannica (11th ed.). 1911. Silverman, Allan. "Plato's Middle Period Metaphysics and Epistemology". Stanford Encyclopedia of Philosophy.